In January we began development of a mobile user interface for Sound RIDER! Working with our developer outside Portland, we looked at the various third party options, tested one called 51Degrees, watched it crash horribly and wrote our own code instead. Our mobile code worked well rendering the prime content and some minimalist menu options. We continued to upgrade the user interface… Until Apple forced iPads into rendering the mobile view, even though an iPad is perfectly capable of rendering a full website like Sound RIDER! One longtime reader emailed in and asked for a link to the full website. Fact is, it's all under the same page names, the backend server just see's a mobile browser and stripes out the rich content, showing only the prime. Message to Apple – an iPad is not a phone, it is a tablet. If iPads are going to render only the mobile version of SR! then I had to make a decision. At the end of February, I disabled the mobile function altogether. 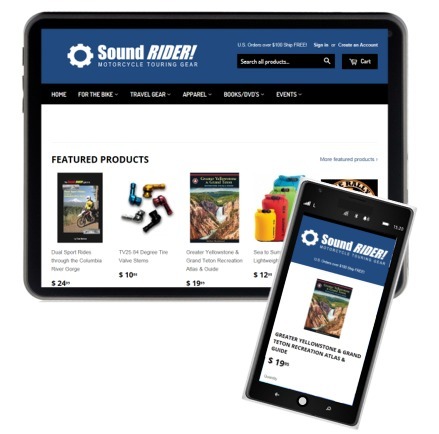 While many blogs are published through WordPress and render fine in mobile and full formats, Sound RIDER! is far from a blog. We have a number of data driven sections of the site including our used bike, hot deal bikes, clubs, newsbytes, communities and calendar pages. The code for these is very sophisticated and can’t be rammed through a cookie cutter blog template. A good comparison to this is what’s happening in the daily newspaper world. Anyone who’s been watching Seattle’s largest newspaper struggling with an attempt at tossing all their editorial content into a cookie cutter format that will render on desktops, tablets and phones knows it’s been quite a struggle. A $4 million struggle. And the fun is far from over. The good news is, we’re learning from their growing pains. We checked our bank account. Sound RIDER! does not have $4,000,000 to develop a cookie cutter apparatus. A spokesperson inside Microsoft’s App Development division points out, it costs about $100,000 to develop a single app that pulls content from various data sources. We checked our bank account. Sound RIDER! does not have $100,000 to develop such an app. However, we’re pretty smart cookies over here and what we’ve done under the hood allows users to read the magazine as it is on a phone with just a few slight moves. The maximum width of any page is 800 pixels, which means it will render and be readable on any desktop, tablet or smartphone in the current market. It gets even better if you rotate your phone 90 degrees into landscape mode. Using this option you get not only the prime content, but the rich content that wraps each page. If you’re over 40 and left your reading glasses at home, simply stretch the pages on the screen to increase the font size. Most editorial pages will also render in the “reading mode” many mobile browsers are equipped with these days. Our new storefront, which debuted in February, operates under the app-like cookie cutter template provided by Shopify and works pretty nice on smart phones. Because of its two column format in the prime content area, the home page of the magazine is a bit tight in portrait. Turn your phone 90 degrees, stretch out the prime content if you need to and it’s pretty simple to read Sound RIDER! on your next bus trip downtown. Which brings us to another subject. When is the time to read websites on a phone in the first place? We see phones as a last resort for reading websites, when most people have a desktop, tablet and phone at their disposal these days. Nobody’s eyes are getting any better, so when you don’t need to, don’t torture yourself spending your entire life reading a freaking phone… Breakout the tablet at home during your leisure time and enjoy the large screen on your desktop or laptop during work or home office hours. We live in a great time. Sound RIDER! is a place where the motorcycle community gathers to stay in touch with what’s happening locally and beyond. You have my commitment that whatever format you want to read the magazine in each month, we will do our best to make it functional across all platforms within economic reason.